If you have ever wanted to quickly and easily add something to your site that that makes visitors stay longer and keeps them coming back again and again - this is exactly what you have been looking for! "It's like instant website stickiness in a box"
Let's fact it... having an interactive element to your site is hands down the best way to make your website stickier than a tube of superglue. Interactive tools that require no maintenance on your part are better still because you set it up once and can forget that it's there (but your visitors wont forget)! Imagine the repeat traffic from visitors who bookmark your site and use your tools again and again. Not to mention that webmaster tools make great "linkbait" for sites like Digg, forum sigs and other viral traffic builders! These tools won't just increase your traffic, they can increase your income as well! Integrate these scripts in to your site, add some ads above and below the scripts to promote your own list, products, adsense ads, or affiliate products to a loyal repeat audience. And thats not all! Because this package includes MRR (Master Resell Rights), you can upsell your visitors on the script package it's self so that they too can place it on their sites! It doesnt get better than that! * Master Resell Rights to sell this package over and over again for 100% profit! Would you like to see the scripts in action? 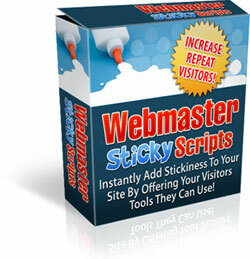 Don't delay, pick this package up today and make your website instantly sticky!